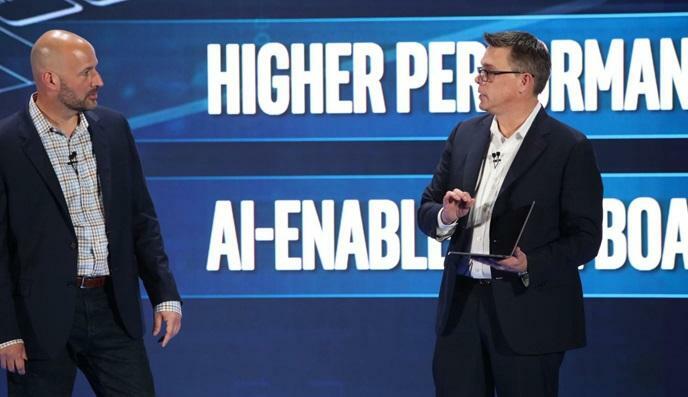 Hours after ASUS debuted its dual-screened concept device Project Precog, Lenovo's Jeff Meredith took the stage at Intel's Computex Keynote to show off a preview for a new 'AI-ready Generation 2 Yoga Book'. The original Yoga Book was released in late 2016 to somewhat mixed-reception after a popular debut at IFA some months earlier. It features an ultra-slimform factor a unique design that eschewed a physical keyboard for a 'Halo' touchscreen surface. Giving consumers a sneak peek of the 2nd-gen Yoga Book at this year's Intel Computex keynote, it was revealed that the new 2-in-1 will ditch the first-gen's halo keyboard for a dual-screen configuration that sounds very similar to ASUS' newly-revealed Project Precog. Like Precog, Lenovo say that the new Yoga Book will feature an AI-driven keyboard and an "enhanced inking experience." However, unlike the Precog, there's no word (at least, yet) on any sort of more granular AI integration that ASUS talked up during the reveal of their latest concept product. Lenovo doesn't really have a major presence at this year's Computex, so expect more information on the new Yoga Book to drop later in the year.